Gifts She is Going to Love! 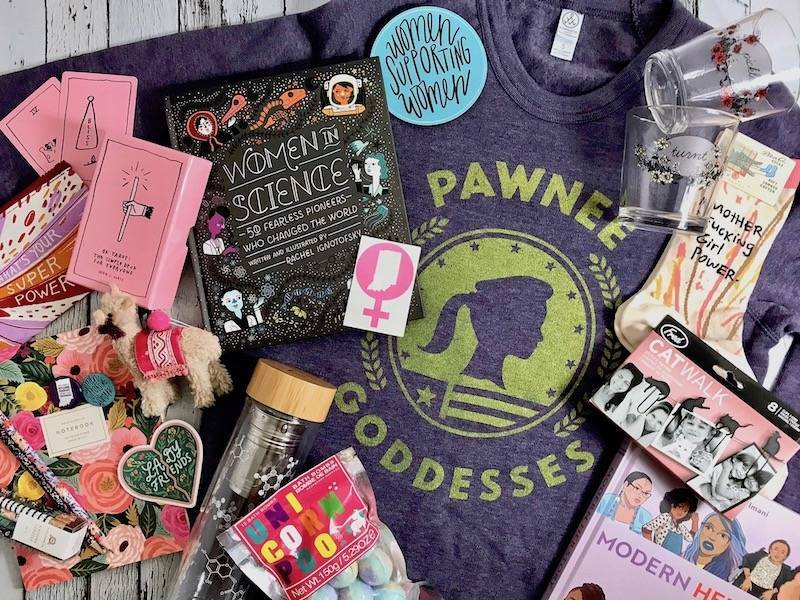 We've carefully curated this adorable collection of goodies for your favorite gal! We understand the last minute stress of buying gifts and hope this sparks some inspiration. Women in science is the exact book you've been looking for; it details 50 fearless women that are known for being pioneers in the science industry. Each woman mentioned in the book has positively changed the world of science and provides encouragement for women everywhere. Pair this inspirational book with a glass chemistry tea decanter. Depicted with common molecules in tea, it is more than perfect for the professional gal that enjoys tea on the go! To piggyback off of the tea glasses, we've added some floral printed drinking glasses. Scripted with "pickled" and "turnt", we are sure these glasses will have her smiling to the last drop. We are also freshly stocked up on Pawnee Goddesses purple sweatshirts! They are more than comfortable and are a terrific fit. Printed right here in Indy, this makes for a great gift that also helps to support a local business, USI! On the topic of comfort, add a pair of girl power socks to remind her that she is empowered and a badass babe. Another idea for the gal that enjoys locally made goods, is the Women Supporting Women button and sticker! Made with a durable vinyl, they will last for years to come and are a friendly reminder to support each other. Throw in some unicorn bath bombs for a touch of color and added fun. They make for a great stocking stuffer and she will love taking a rainbow bath. Remind her of her awesomeness with an Indiana feminist sticker. In a bright pink, the sticker will look fantastic on our juliet rose notebook set! Add a set of instagram worthy floral pencils made by Rifle Paper Company with a girl super power pencil pouchfor easy carrying that will complete the gift. Hang those adorable insta pics with ourcatwalk paperclips for an additional personal touch! For the modern gal, we've added modern HERstory. A book of 70 inspirational women whom have changed the world and continue to transform radical ideas into actions. One of our newer favorites in store and online are the pink tarot cards! They are a little touch of magic that is super cute and fun to channel her inner psychic. You may not know exactly what to buy for her, but we know that this fuzzy alpaca ornament will have her smiling from ear to ear. Plus, they look so good on the Christmas tree and are cute to have hanging up all year long!